Now is a great time to read baseball articles from around the country, as Hall of Fame voters often write columns announcing and defending their ballots for next spring's induction. Voters get to vote for a maximum of 10 players from the list of nominees that we glanced over in this post last month. After careful (not very careful) deliberation, my Hall of Fame ballot would contain check marks next to the following names: Bert Blyleven, Tim Raines, Roberto Alomar, Barry Larkin, Edgar Martinez, Alan Trammell, Andre Dawson, and Fred McGriff. They won't all get in, but it would be fine for my Hall of Fame. Posnanski recently spent 5,000 words discussing, among other things, the infinite possibilities of who's in & who's out of everyone's perfect Hall of Fame. He compared the Hall of Fame in Cooperstown, with Baseball Think Factory's Hall of Merit. So, why did I pick those eight guys? Why were these my 'eight men in'? (sorry, that's really bad.) Whom did I barely leave off my ballot? Who's asking these questions? Rich Lederer is my unofficial leader of the pro-Bert for HOF movement. This post from December 12, 2005 opened some minds. In fact, on December 17, 2005, Bob Klapisch, calling himself 'a late convert', joined the flock. So the next time someone tells you that Bert Blyeven never won a Cy Young, you can say: “Yeah, but he won more 1-0 shutouts than Cy Young.” And he did it when the ball was LIVE. The Hall of Fame seems to come down to a player’s peak and his longevity. Was he truly great at his best? And was he good for a long enough time? Well, Tim Raines had a huge peak. From 1983-87 — the five year peak — he hit .318/.406/.467 for a 142 OPS+, the same OPS+ that Jim Rice had during his five-year peak. During those five years, he averaged 114 runs scored, 34 doubles, 10 triples, 11 home runs and 71 stolen bases a year. He led the league in runs scored twice, batting and on-base percentage once, doubles once, stolen bases twice, and could have won three MVP awards. He had 163 win shares in those five years — an average of 32.6. Bill says a 30-win share season is an MVP-type year. Tim Raines also had a huge career. He reached base almost 4,000 times … or to compare him to a similar player, about 150 times more than Lou Brock. He’s fifth all-time in stolen bases. His .385 on-base percentage is the second-best among eligible Hall of Famers with 9,000 plate appearances (behind only the Walking Man Eddie Yost), and his slugging percentage is better than Rickey Henderson’s or Brock’s and just two points behind Joe Morgan. This is not a borderline Hall of Fame candidate here. This is a dominant player. He never really got his due as a player while he was playing … in part because he shared his era with the great Rickey Henderson, in part because he spent his best years in Canada, in part because he was hammered by collusion, in part because on-base percentage did not (and does not) get the respect it deserved, in part because leadoff hitters tend to be naturally underrated, in part because he spent his last six or seven years as a part time player and that image of the older Raines was burned in the memory of people (especially his two championship years with the Yankees). He had it all, or was just a touch less powerful than someone who had it all. He was the best defensive second baseman in the world for a while. He was awesome for about 11 years, from 1991 to 2001. Most importantly, he won and played well at the highest level with Toronto's first and last World Championship teams. Maybe I give him bonus points for flopping with the Mets in 2002. That was classic. Alomar was coming off arguably the best season of his career for the Indians in 2001, career high OPS of .956, to go along with 113 RBI, 100 R's, 20 HR's, and 30 SB's. I find Barry Larkin's case to be similar to Alomar's and Trammell's. Larkin was an offensively gifted middle-infielder who lead his team to World Championship(s). His career shows how hard it can be to accumulate some counting stats. He played from the time he was 22 until he was 40, with a lifetime .295 Batting Average, yet he had only 2,340 hits. He's in my Hall due to his well-rounded abilities to use all five tools, my intangible feelings about winning and leadership, and other indefensible reasons like consistency. Here are some nice career stats: 379 stolen bases, caught only 77 times, BA/OBP/SLG career slash lines of .295/.371/.444, he walked more than he struck out, and of course he won a World Series ring in 1992. The best Designated Hitter I've ever seen deserves his own post, or series of posts. He is a player who got a late start, after being mishandled by the Mariners as he toiled away in the Minors until he was 27 years old. Look at his stats, from 1992 and 1995 through 2003, when his OBP never dropped below .403, he hit with power, and ended his career with slash lines of .312/.418/.515. He gets penalized by some voters for playing most of his career as a DH, but I don't buy that for many reasons, of which I'll share three. First, should he be rewarded if his manager sent him out to play terrible defense like we sometimes see with guys like Jack Cust, Adam Dunn, and Jason Giambi? Do they help their teams more than guys who spare their teams crappy defense and DH? Second, the argument holds some water, if we're talking about a borderline hitter, but Martinez is an elite warrior with the bat. He could work the count, take a walk, hit an occasional "ground ball with eyes", and drive mistake pitches into gaps and over walls outfielders' heads with regularity. 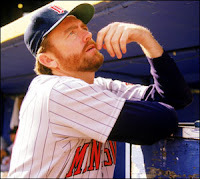 Third, the precedent has been set when Paul Molitor got in on the first ballot. Sure, he had the automatic ticket of 3,319 hits. Still, he was a DH for many of those hits, and his career OPS+ of 122 is dwarfed just enough by Martinez's 147, that I have to stand firm on this one. 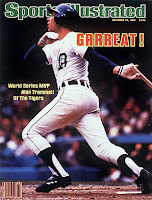 I feel that Trammell will never get into the Hall, mostly for being in the shadow of Cal Ripken his entire career. He was a leading winner in Motown for Sparky Anderson (not easy), and he had a very impressive peak in the mid 1980's. He's a borderline candidate, and I will stand with his supporters until proven otherwise. The Hawk is my favorite player of all time. He was the first super-human player I ever rooted for, and there is NO WAY he's staying off my ballot. I've heard the arguments against his induction, most loudly the fact that his career OBP was an abysmal .323. I choose to believe the arguments that only three players have 400 HR's and 300 SB's: Mays, Bonds, and Dawson. He won a bunch of Gold Gloves. Played Centerfield beautifully in his hey day in Montreal. Then, he commanded Right Field, with a cannon arm and great instincts in Wrigley Field and stops with Boston and Florida after that. I also think that playing his peak years one Montreal's concrete & turf field ruined his knees more than most players in baseball history. If he'd played on a surface that kept him limber, he could have been a first-ballot Hall of Famer. Of course, the Hall of Fame would have thousands of players if we could all cancel out a few "if's". I expect McGriff to get in eventually, but I'm not sure about this year. He never (or very rarely) felt like a Hall of Famer during his playing days. How many Hall of Famers are traded four times? His ability to play, like Larkin, from the age 22 season to age 40, enabled him to hit 493 Homeruns, drive in 1,550 runs, and 2,490 hits, with a career 134 OPS+. All right, folks, let's hear from you. You can only vote for 10 guys. Who's on your ballot? Wonderful post! I agree 100% with you on Dawson, Blyleven and Raines. Dawson's OBP shouldn't be weighed so heavily. His job was to knock in the guys ahead of him and he did that. He is 10th all-time in sacrifice flies! I'd take that any day of the week over a walk. If he was a lead-off man or two-hole hitter, OBP would be a different story. If you love Andre, stop by my blog!